Anchorage Marijuana Sales Tax Bond • Surety One, Inc. Per Anchorage Municipal Code (AMC) 12.50.160, retail sales tax on marijuana and marijuana products must be guaranteed by a surety bond or acceptable financial assurance. The Municipality of Anchorage reports, "Subsequent to voter approval of Proposition 2 on April 5, 2016, authorizing a five percent sales tax on the retail sales of marijuana and marijuana products, the municipal administration proposed Anchorage Ordinance (AO) 2016-49, amending the municipal code by enacting Chapter 12.50 Retail Sales Tax on Marijuana and Marijuana Products. At the May 10, 2016 regular meeting, the Municipal Assembly passed and approved AO 2016-49(S), explaining the requirement as well as the procedures for the administration, collection, and enforcement of the marijuana retail sales tax. Pursuant to the code, a marijuana retailer must provide a financial guarantee of his or her fiduciary duties under a marijuana retail permit. The retailer may elect to provide an Anchorage marijuana retail tax surety bond issued by a corporate surety licensed in Alaska. bond shall be in a form acceptable to the municipal attorney. The surety bond must name the municipality as the beneficiary (obligee) and be conditioned upon payment in full of the tax, including penalties and interest due and to become due and owing to the municipality during the bond term. The anchorage marijuana dispensary bond must be written in and amount that the amount that the chief fiscal officer estimates to be an average amount of annual marijuana sales tax collected by the retailer, a comparable retailer, industry averages, or in the amount of ten thousand dollars ($10,000.00), whichever is greater. The marijuana tax bond must remain in effect for the term of the license in accordance with section 12.50.080. 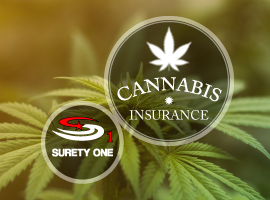 Alaska surety bond leader, SuretyOne.com is the most responsive underwriter of the surety bonds and insurance coverages for the commercial marijuana sector. We firmly believe in supporting the availability of marijuana-based products to patients that benefit from them and availability for social use by responsible adults. We will consider applications for dispensaries, testing labs, delivery services and grow operations in all states where current legislation favors legal marijuana businesses. For further information about the surety bond for retail sales tax on marijuana and marijuana products contact us at (800) 373-2804, email Underwriting@SuretyOne.com or chat with us live here.